Creating a seamless link between Digital Video and Access Control, APACS Universal Video Interface unleashes immense synergy between the two systems. Video recorders from multiple vendors are unified in Apollo software interface. Combined with APACS messaging, video data and video-related events bring an extra dimension to tracking history by retrieving associated recording with just a mouse click. Operators get easy access to live views from map icons and automated pop-up windows during important security events. All this can be combined with a wide choice of DVRs, NVRs and IP Cameras for a truly flexible system. Events in the video system are displayed via the same method as other Access Control System events. No need to learn a new system and already familiar powerful options can be used. Many functions of the video system can be controlled automatically in response to system events: start and stop recording, preset control and video window control. Easy manual control is also not a problem with user-selectable multiplexed views and a simple but powerful control window that pops up at a click of a mouse. Video recordings can be associated with Access Control System events to ensure the easy retrieval of pertinent clips when researching past events. No more sifting through hours of video in order to find a few precious seconds: tying events such as a forced open door alarm with the video makes searching instant. Video can also be searched using advanced motion detection technology to go right to the action. Supports a wide variety of DVR, NVR or Hybrid servers from Apollo, Bosch, Panasonic, Verint, Pelco, Infinova, Milestone and Samsung. 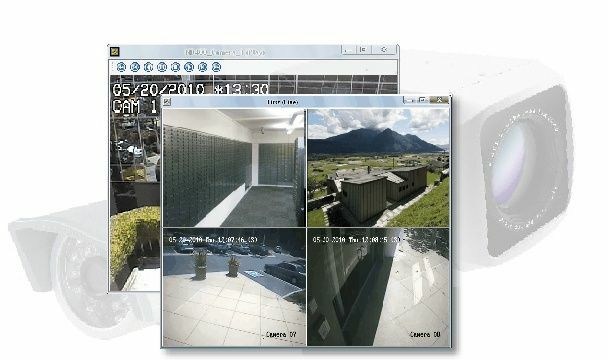 Cameras from different vendors can be combined on a single DVR view window for live or recorded video playback operation. An intuitive and easy to navigate user interface makes controlling the video system simple and quick. Controls are integrated into the APACS user interface for easy operator use. The unique ability of supporting 10 major video brands simultaneously in the same system benefits large corporate clients that are trying to unify their business systems after mergers and acquisitions. Most existing video installations can remain in place or even be expanded using different brands, and still the management of the entire system remains unchanged: operators continue using the same APACS interface, without even knowing that components of different vendors operate together at the lower level. This is an excellent way for end-users to continue receiving benefits from the investments that they made into video systems years ago, as well as strong leverage in negotiations for system expansion, as they are no longer locked into a single vendor. Choose the right video recorder for your site with desired features: dual-stream viewing, digital watermark, video motion detection, IP camera support and many more. All integrations support all basic camera functions like PTZ, manual recording and snapshots. Certain integrations allow advanced controls of camera video/audio stream, such as brightness, contrast and sound. PTZ controls are implemented in a user-friendly manner using mouse to point and move camera in required direction. Some vendors support automatic video snapshot export based on selected events and conditions. All integrations are updated to latest versions with each APACS software release.